In this current age, it is vital to know what people are saying about you on social media. This is as important for brands, as it is for influencers, and indeed ordinary people. In the case of businesses, you want to know genuine organic mentions of your brand – both positive and negative. This is particularly important when somebody complains about your brand online. You can’t remedy a problem if you don’t know of its existence. Often all it takes to make somebody happy is a reply, where you recognize his or her concern. The problem with social media is that people are now accustomed to near instantaneous reply. For you to react with speed, you first need to know when you have a brand mention. A key part of social media management is keeping people happy. Influencers also need to play the same game. They rule their niche because people trust them and believe in their authenticity. If the sentiment changes and people begin to doubt an influencer’s sincerity, it is vital the influencer learns of this as quickly as possible. Some of the tools we cover focus on social media listening, while others are more into social media monitoring. Although people often use the terms interchangeably, there is a subtle difference. Social monitoring is the first step in a social listening strategy. 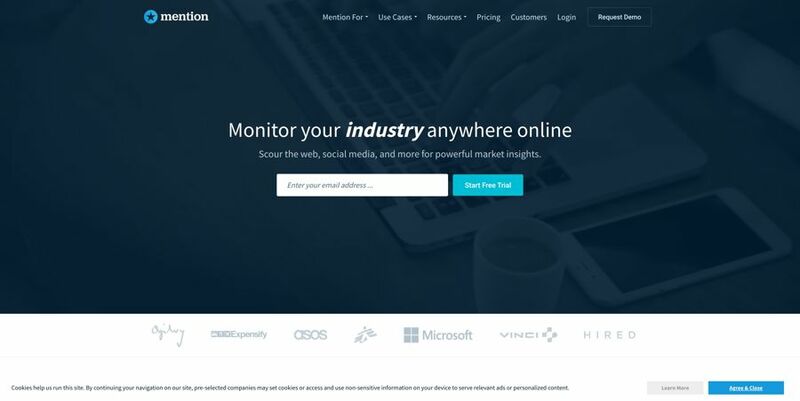 A firm monitors all mentions of its name online, particularly on social media. Once you have discovered social mentions, you can then go a stage further and analyze what the mentions mean. You look for patterns and trends and discover the influencers who already organically promote your product. 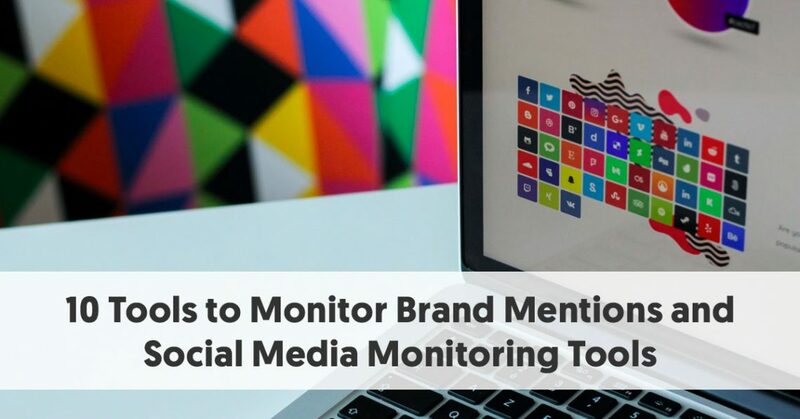 Brands and influencers can use a combination of the following tools to help them discover all brand mentions and to monitor the sentiment on their social media accounts. Mention is excellent for discovering when people have mentioned you online, as well as analysis of the sentiment expressed in these mentions. The $29 / month Solo Plan is ideal for a single user wishing to monitor mentions of their brand. This plan allows two basic alerts and records up to 3,000 mentions per month. The difference between an alert and a mention is that an alert is the keywords you have Mention crawl the web in search of, for example, it could be your brand’s name. Each time the tool finds a reference to that alert, it creates a Mention. Every time it finds a Mention, it will send you either a customizable push notification or an email notification, depending on your settings. The next level, designed for small businesses wishing to monitor their brand and competitors, is the $99 / month Starter Plan. This increases your allowances to 5 basic alerts, 5,000 Mentions, and 3 users. In addition, at this tier, you gain access to a dashboard, sentiment analysis, and an influencer’s dashboard. If your needs are higher (or your business larger) then you will have to talk with Mention about their Custom Plan, where you can negotiate your requirements, and gain additional features. One great feature of Mention is that it discovers mentions of your brand in Facebook conversations, which can be a valuable way of discovering disgruntled customers. Mention has also developed an API, so you can incorporate it into your website. Although Buzzsumo is not primarily designed as a brand mention or social media monitoring tool, it does come with the ability to set up content alerts. It sends you content alerts on a daily basis whenever it encounters a reference to your brand on social networks. It allows you to set up alerts for your brand, competitors, keywords, authors, domains, and even backlinks. 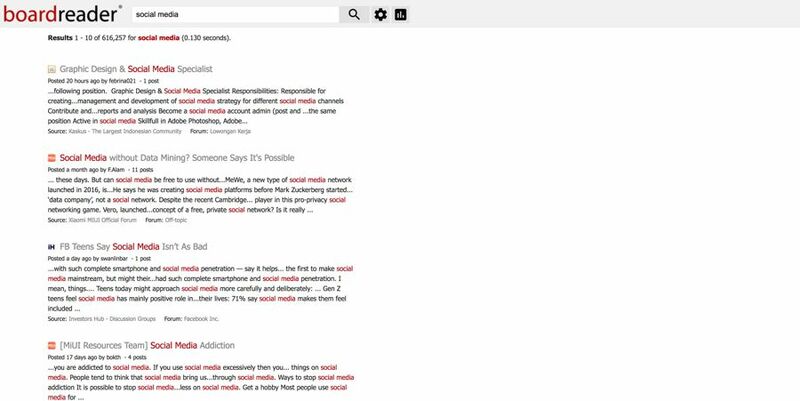 You can refine your alerts to cover just the title of an article, or to search the full text of articles. You can even set it to send an alert when somebody creates a new backlink to your site. Buzzsumo allows you to set up your alerts to come via email or RSS. It also allows you to create a personalized dashboard to monitor all of your alerts. As a business, you may opt to receive your alerts by daily alert, although real-time alerts are probably more practical when dealing with dissatisfied customers. Usually, when we think about Hootsuite, it is as a social media scheduling tool. Hootsuite makes it easy to schedule your posts across a range of platforms over a period, all from a single dashboard. However, one of the useful features of Hootsuite is that you can add a wide range of streams to each social network data dashboard. As well as obvious columns, such as Home, Timeline, Lists, and Scheduled (depending on the social network) you can create streams based on filters. This is particularly useful with Twitter, where you can set up a stream based on searches for particular keywords – your company name or custom hashtag, for instance. For some of the other networks, such as Facebook, the easiest way to monitor your brand name is to set up a stream filtered by Mentions. Because Hootsuite can cover so many social channels, it helps you monitor mentions across your full range of social networks. TweetDeck is a free tool that looks very similar to paid social media scheduling tools, such as Hootsuite. As Twitter owns it, however, it only covers that social network. It can be a much quicker way to check and manipulate your Twitter account than in Twitter itself. You can set up multiple columns to show relevant combinations of tweets for multiple Twitter accounts. While most people choose to pick columns like Home, Notifications, or Messages, you have many more options. This includes setting up a column for @mentions – either on a specific account or across accounts. You can set up multiple columns to monitor a wide range of keywords if that is of use to you. You can respond directly to tweets from within TweetDeck. Social Mention has a very simple interface. It merely presents you with a search box (marked Trends) and a list box, with choices for All, Blogs, Microblogs, Bookmarks, Images, Videos, and Questions. You then click on a Search button to discover where your keyword term has appeared in recent times. If you use your brand name as the key term, Social Mention helps you discover references to your brand. Social Mention monitors more than 100 social media properties directly including Twitter, Facebook, FriendFeed, YouTube, Digg, Google etc. It is a free tool and offers an API for developers who want to interact with the Social Mention site programmatically. Social Mention does more than just tell you when your keyword/brand is mentioned though. It includes sentiment analysis, including whether each mention is positive, neutral, or negative. It gives percentage scores for each term, relating to strength, passion, and reach, as well as a sentiment ratio – positive: negative. Social mention also gives you the option of carrying out an Advanced Search, helping you to better refine your term, and the sources for your results. Aa well as providing a point-in-time social media search, you can sign up for a daily social media alert, to help you better monitor your brand’s mentions and sentiment. Although social media is where most of the online social interaction seems to be nowadays, older places, such as forums and messaging boards, still have an attraction. This means that if you want to measure brand mentions, you need to look at these kinds of online activity, too. Boardreader is ideal for searching for a specific term, your brand for instance, across a range of forums and digital places. Like Social Mention, Boardreader has an extremely simple interface. All it presents you with is a search box and a button to click on. You can enter your brand into the search box and generate a list of mentions of the term on a range of forums over the last two years. It will then come up with a list, potentially very large, of mentions, beginning with your most recent mention. It provides you with a range of search option, including the type of post, date range, language, domain (if you want to link your search to a specific domain), way to sort, and the number of results per page. You can also take an Advanced Search if you want more granular data. Another very useful feature is that you can select to graph mentions of your term. This makes it clear if there are any patterns or any particular days when interest in the phrase spiked. Talkwalker is a large-scale social marketing tool, aimed predominantly at large businesses and enterprises. One of its components is Talkwalker Analytics, which is a social listening and analytics suite. It analyzes online, social, print and TV/radio content in one. It incorporates image recognition technology to track 30,000 brand images. Not only can you monitor results in real-time, but you can also access more than two years of historic data. Talkwalker provides the tools to undertake social listening for your brand over 10 social networks. It goes further than that, however, and monitors discussion on online news sites, blogs, forums, and even offline databases. In total, it monitors 150 million websites. 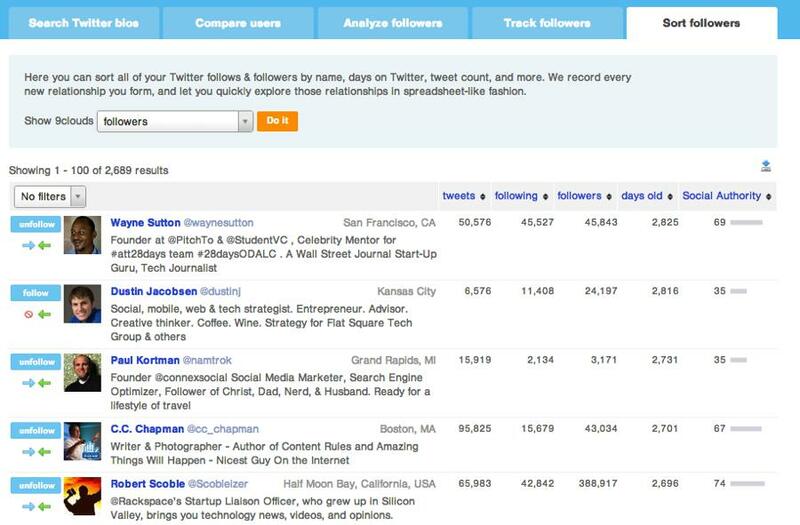 Followerwonk is a Twitter tool, designed to help you find, analyze, and optimize your social growth. It began life as a Moz product, but they sold it in 2017. You can use it dig deeply into your Twitter analytics. You can search Twitter bios, connect with influencers or fans, and break them down by location, authority, number of followers etc. It gives each Twitter user a social rank, for instance, both Justin Bieber and Barack Obama have social authority scores of 96, now overtaken by Donald Trump with Social Authority of 100. However, search is not restricted to particular accounts. You can search for a keyword term (your brand, for instance), and Followerwonk will come up with a list of all the Twitter accounts with that term in their bios. SumAll is a free social media automation tool targeted at small and medium-sized businesses. It allows you to connect all your social platforms and set up automation with just a few clicks. This includes free content scheduling and data tracking. It sends you a daily email giving you top-level statistics about our social account activity. You can use these to spot any obvious differences compared with previous days and weeks. It provides you with insights about your followers, interactions, and engagements. Of course, the cheapest way to monitor your brand mentions in social media is to use each social network’s inbuilt native search or analytics tools. This can be more time consuming than the other paid methods, however. They may be of value for individuals or small brands that are just starting the process. Twitter, for instance, has a quite advanced search tool. You can search for keywords placed anywhere in a Twitter bio or in the tweets themselves. You can make your search even more powerful by using Boolean search tools, such as AND and OR, as well as putting terms in quotes when searching for a specific word sequence. You can also search for hashtags, and @ terms.